An experiment in a utopian community that only lasted seven months should have easily been forgotten in history, even if it included historically important people. Yet the fascination with Fruitlands continues as evidenced by Richard Francis’ book, Fruitlands: The Alcott Family and Their Search for Utopia which came out this year. 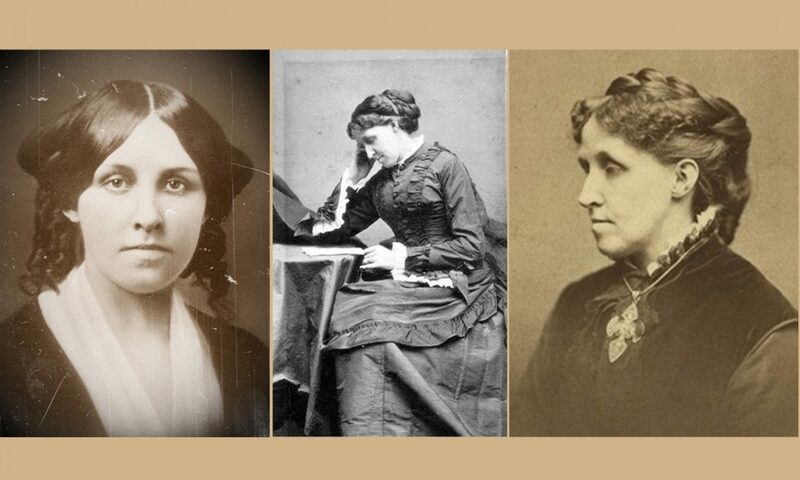 There is no doubt that Fruitlands was a cathartic experience for young Louisa May Alcott. Considering the extraordinarily complex and bizarre nature of the thinking behind Fruitlands, I was quite surprised to find a children’s book written about that very subject. 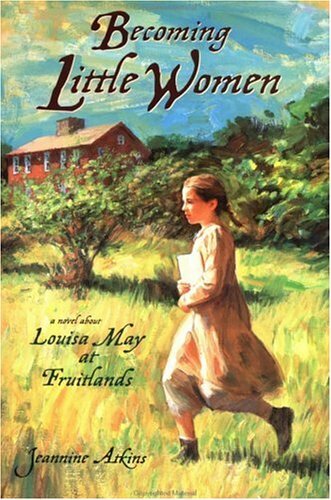 Becoming Little Women: Louisa May at Fruitlands by Jeannine Atkins is an engaging fictional account based on the writings of Alcott family members. Atkins presented the philosophy behind Fruitlands in a concise and simple manner that children could understand (and adults could benefit from). Founded by Transcendentalists Bronson Alcott and Englishmen Charles Lane, Fruitlands was meant to help those living in the community to achieve divine perfection through simple living and high-minded thinking. The diet and methods of farming were devised to avoid any action that would support the slavery of humans, and of animals. The community was to live as one family where the children would have many “fathers” and “mothers”; the bonds of human love and family were discouraged in favor of the “consociate” family, meant to achieve a higher, divine form of love. Becoming Little Women opens with the Alcotts and Lanes moving from Concord to the Fruitlands farm in Harvard during a dreary rain storm. It is a fitting beginning for an experiment not only doomed to failure, but also perpetrating one of the most traumatic crises to strike the Alcott family. Atkins paints a picture of a ten year-old Louisa, full of life, vigor, imagination and stamina. 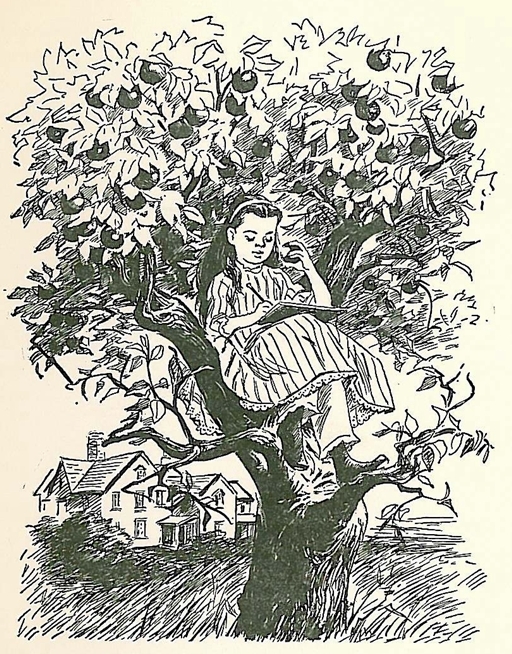 She sits in an apple tree spinning stories and poems while eating apples. 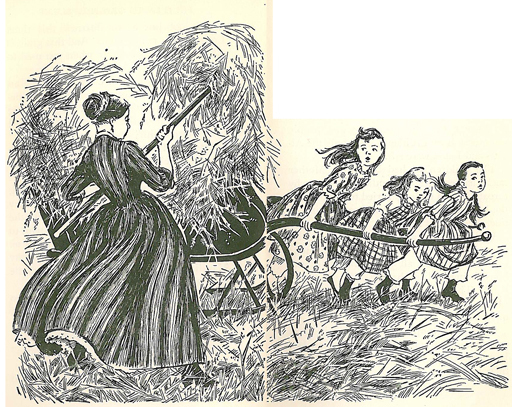 She races through woods and fields with her sisters and William, the son of Charles Lane. She dreams up and performs dramatic plays with her sister Anna as a way of releasing the tension of the experience of Fruitlands which was growing darker by the day. Atkins shows a conflicted Louisa, struggling with her temper and tongue, trying to force the square of a vigorous temperament to fit into the circle of her father’s concept of serenity and perfection. 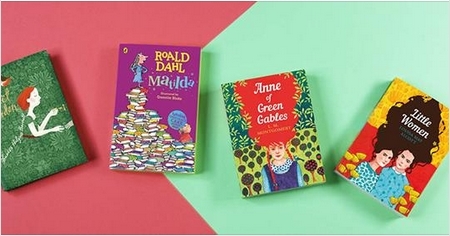 Becoming Little Women‘s study of characters truly propelled the story. I appreciated her portrayal of the tragic William, abandoned by his mother to be raised by the remote, grim and self-absorbed Charles Lane. There is little written about this young boy so Atkins takes literary freedom to infuse life into him. The result is a believable and sad portrait of a child whose father has little or no regard for him, and who eventually abandons him to a Shaker community for a time. William fades into history and we never know what became of him, but Atkins makes you feel for him and wonder if he ever knew happiness or love. Louisa, in typical big-heartedness, embraced and befriended him, offering him the sisterly affection he had never known. Atkins also fleshed out Louisa’s older sister Anna. Often portrayed in real life as saintly and the mirror image of her father, Atkins digs into Louisa’s portrayal of her as Meg in Little Women, rounding her out as sometimes vain, envious of others, and competitive with Louisa for the approval of her parents. Anna emerges as a believable girl of twelve with a vibrancy often missing from other accounts. Abba Alcott or “Marmee” is painted as the endless workhorse, carrying the true burden of Fruitlands while the men wiled away endless hours in high-minded talk. 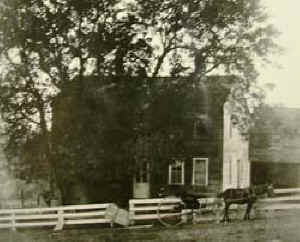 Many accounts of Fruitlands paint Abba as the reason why the experiment failed because of her fierce devotion to her immediate family. Atkins paints a realistic portrait of Abba, heroic in her efforts, yet stressed, bitter and often desperate as she tried to reach Bronson and bring him back down to earth to face reality. Women being so restricted in their actions as they were in this era, Abba is shown constantly pushing the edge of the envelope to save her family, even considering separating from her husband to save her children. I felt vested in these people as they struggled through this experiment in utopian living. Fruitlands was more like Purgatory than Eden, and through these vibrant characters, I felt their joys and conflicts, tensions and traumas. Atkins deals with the very grown-up issues of family conflict that can lead to separation, the struggle to live up to parental expectations, and the consequences of living with people who have little regard for the needs of others. Most of what happened in the story felt authentic and age appropriate although there was one event which felt a bit too “current” and too adult for a children’s novel. Therefore I highly recommend Jeannine Atkin’s Becoming Little Women: Louisa May at Fruitlands as an enjoyable read and a way to feel the experience of Fruitlands and mid 19th century living. In my next post, I will share an interview with Jeannine, finding out more about how she fleshed out these characters and came to write a children’s book about a difficult subject. 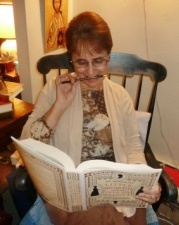 Jeannine is one of my readers, that’s how I heard about it. Glad she wrote to me. The minute I heard about this book I wanted to read it.